Why does the program scan less quantity of goods than Amazon? 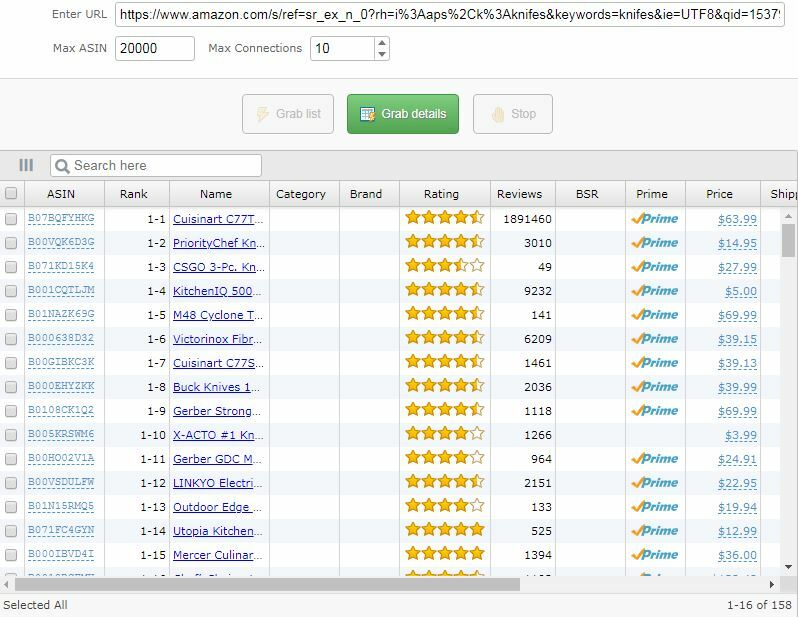 The total number of results that Amazon displays at the top very often does not correspond to the actual amount. Amazon does not show more than 400 pages of results. 400 pages it’s not more than 10 thousand listings. For this reason, the number of products scanned by the program is much less than on the site. We go to Amazon and enter into the search line the name of the goods that interest us. In our case, these are knives. We see that the site has produced 40,000 results. Also, we see that 16 products are displayed on one page. And now scroll down the page and look at the total number of pages. There are 20 of them. We multiply the number of products and the number of pages and get 320 products, which is very different from the number of goods specified by Amazon. The number of displayed pages can be increased (but not more than 400) if you select the «Availability» category on the left on the Amazon page and tick the «Include Out of Stock». Then there will be more results because even goods that are not in stock at a certain moment will be included. We copy the link of this page and paste it into ASINSpotlight for scanning. And we get 158 ​​goods. Also, the number of scanned items is affected by the filters in the program. Therefore, if you want to scan all products, you need to remove all the checkmarks in the Filters tab. Are you ready for Amazon Prime Day?